Fully custom made van seat covers made from leatherette-man made leather. A truly remarkable and durable fabric which we have engineered to suit this particular van. Colour: Neon blue with dark shade backing leatherette fabric. Please tell us the year/ specification of your van. AN ISO 9001:2001 Compliant Product. We may have used a library photo to illustrate this product....but we will most certainly send the correct size/ item to you. Driver Seat Cover: One base section and one top section. This exclusive pattern ensures that apart from complete protection to your seat, there is a remarkable increase in the comfort level which brings about a refreshing change to your driving experience. - Kindly tell us about the number of arm rest/s opening/s you will require, if any, and we will accordingly leave the opening/s for the arm rest/s to come through. Double passenger seat cover: One base section and one top section. 3 tailor made headrest covers, all the holes have already been put in the seat cover to allow the chrome bars on the headrest to go through. These Vauxhall Vivaro Van seat covers are made with original OEM leatherette fabric (man made leather) and the advantage is that it takes more wear and tear as compared to the soft leather. Fully waterproof and wipe down product. 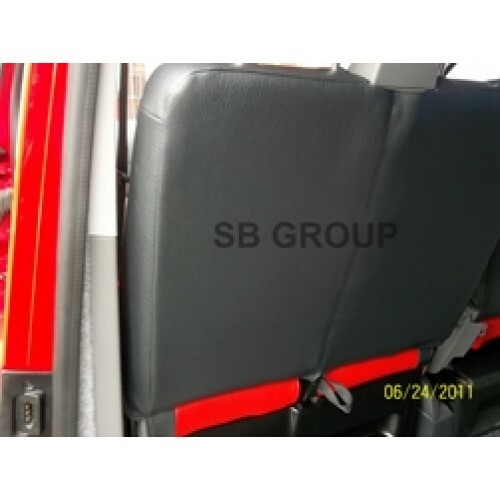 These Vauxhall Vivaro Van seat covers are made with flawless production specifications and are ISO 9001:2001 compliant. With high grade specifications these Vauxhall Vivaro Van seat covers enhance the looks, increase the life span of the original seats, remarkably improve the resale value of your van and enrich the comfort factor and thereby add to your driving experience. Once fitted, you will have the peace of mind that your seats will remain in a pristine condition.